This tank includes all the correct internals for use with petrol injection (PI) both mechanical and electronic as well as carburettor cars. This Large capacity aluminium Fuel Tank is a RevingtonTR designed multi-application unit with outlets to cover TR4, TR4A, TR250, TR5, carburettor TR6 and Petrol Injection TR6. Designed by RevingtonTR using modern CAD methods (thus ensuring manufacturing repeatability) and sold exclusively by RevingtonTR and their partners around the world, this tank incorporates a whole host of improvements ensuring the best possible fit and performance. In creating the drawings we measured 20 original tanks and 5 TR4-6 body shells that had never been crashed or rebuilt. Needless to say they were all different, so a suitable average size of tank was agreed upon. Capacity of 54 litres. The standard tank capacity according to the individual TR4-6 Triumph handbooks is quoted variously from 48.38 litres to 52.88 litres. The extra capacity in our tanks has been achieved by leaving the RH side of the tank square rather than angled. The tank has its lower rear edge angle more than the later US TR6 tank so that up to 15 x 195 x 60 profile tyres will fit easily. Much larger tyres may not fit. The tank fits behind the boot board as usual and is therefore unnoticed when fitted. Improved Mounting Lugs with anti-vibration rubber mountings, which allow for slight positional variation of support brackets in rebuilt or previously damaged cars. In addition whilst reducing vibration the rubber mountings help reduce the risk of the mounting lugs being strained in extreme conditions. 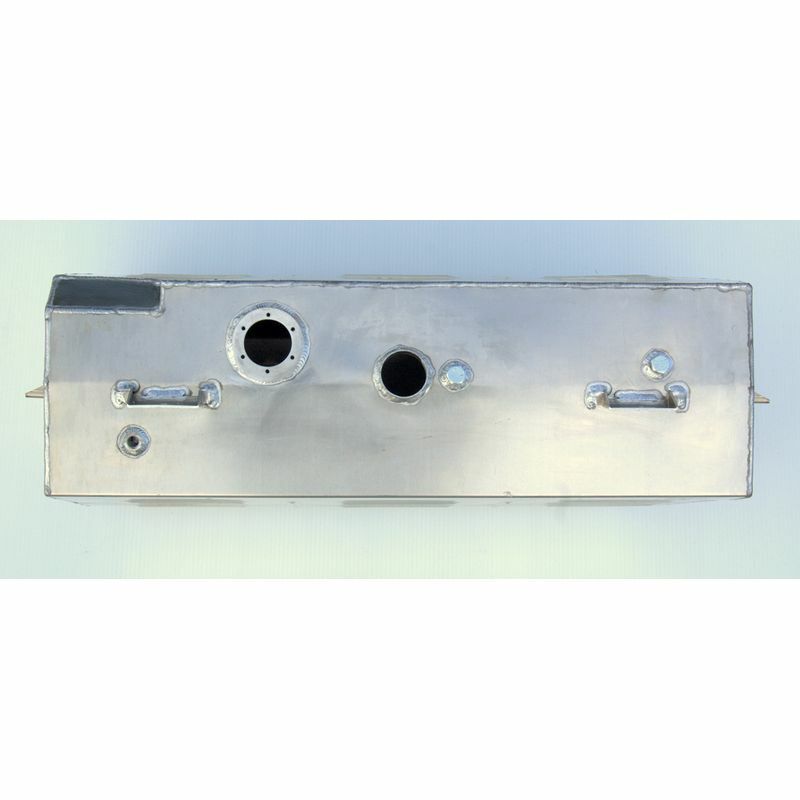 Experience has shown that solidly mounted aluminium tanks can suffer from lugs cracking and splitting away from the tank as the body flexes. Improved baffling and anti-surge reservoir design further reduce the possibility of fuel pump cavitation at low fuel level in fuel injected cars. See the photo of our tank with the end plate removed showing the complex internals. 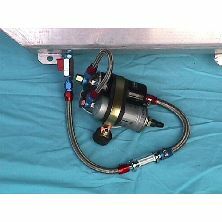 This tank includes all the correct internals for use with petrol injection (PI) both mechanical and electronic. The internal anti-surge reservoir is designed to ensure the car does not 'cough' on left hand turns with as little as 3 litres of petrol in it. Revington TR s bespoke tanks have a swirl pot system internally ( as well as two baffle plates) that performs in the same way as Triumphs solution as fitted to CR cars, but with a larger pot capacity (1.06 litres compared with Triumphs 0.79 litres) reducing even further the chance of the engine stopping on left hand turns. Beware of seemingly similar products on the market, which have an ineffective anti-surge reservoir (or none at all!) and can be 4 or more litres less than standard capacity (8 litres less than ours). In some cases cars we have tested with aluminium tanks from elsewhere have needed more than 14 litres of fuel in the tank before left hand corners can be taken with confidence. Our tank needs just 3 litres! A small recess has been introduced in the RH rear of the tank to accommodate the boot lamp fitted into the TR6 tank board. 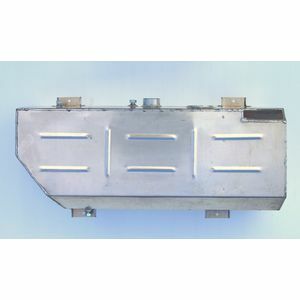 The Fuel Tank is supplied as a kit, which includes as well as the tank, the anti-vibration mountings, screws and washers and a new gasket for re-installing the fuel gauge sender unit. It should be noted that the extra capacity afforded by this tank is primary gained by the redesign of the right hand side of the tank which has a squared off side plus maximisation of other dimensions within the constraints of the bodywork. As a result it is inevitable that the scaling of the petrol gauge cannot be the same as standard. The arm of the sender unit can be adjusted to compensate for this. This is covered in details as is general fitting of the tank in the 6 page fitting instruction manual which is included in the kit. 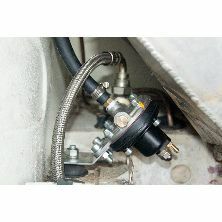 However, the best way to ensure the fuel gauge reads accurately, especially if the sender unit in use is old and likely to be temperamental or fail in the future, is to purchase a new sender unit that is adjustable. 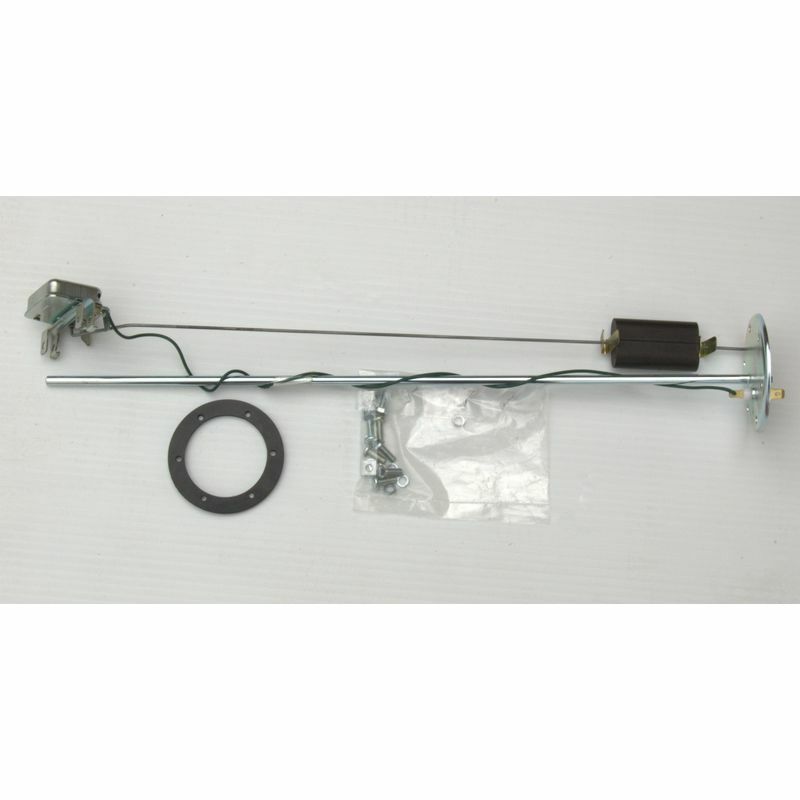 Sender unit kit part number RTR8514 is the product to use. This unit allows the sender arm to be set correctly to read full and empty. See the link to this product below. 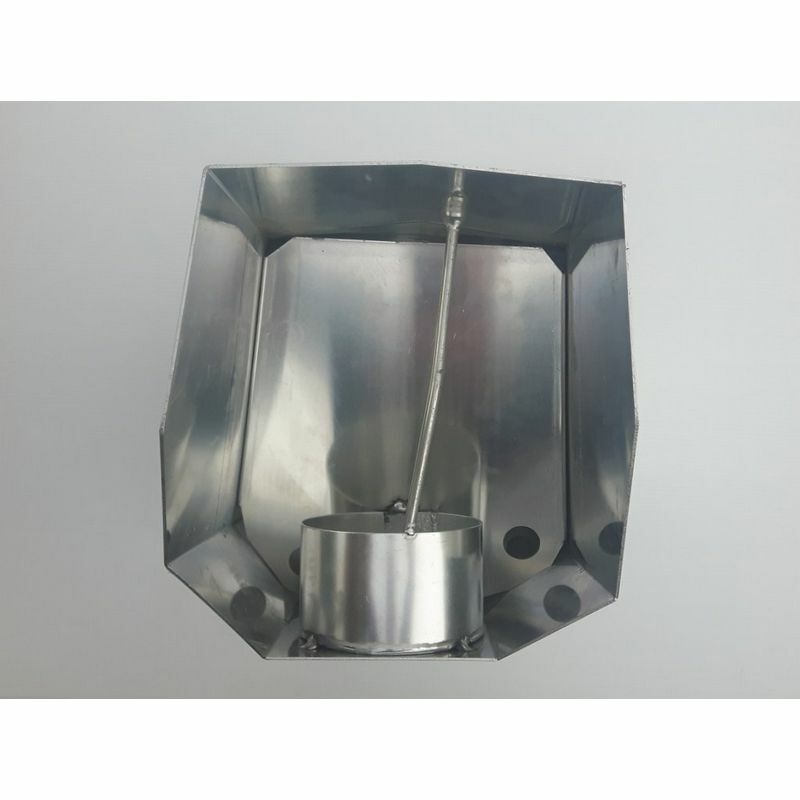 The tank is manufactured from 2.0mm sheet aluminium, the front and back panels are fluted to avoid pinging noises when the tank expands and has a reinforced fuel gauge sender unit mounting hole. Mounting Lugs are manufactured from 3mm aluminium. In October, my wife and I spent 14 days in Burgundy, the French Central Alps (Auvergne, Gorge Ardèche) Savoy and the Black Forest in Germany, altogether about 1900 kms. I'm very happy to tell you that my TR6 ran all the time without the smallest sign of a failure. Awesome! With your new petrol tank all the fuel starvation problems have passed away. Once I left less than 3 litres of petrol in the tank - still no problem! 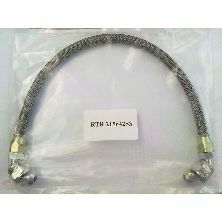 Revington TR information: TR2-6 hose filler to tank. 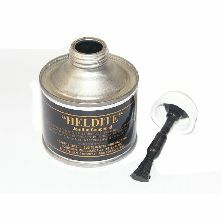 Standard rubber hose will allow unleaded petrol to permeate through its walls resulting in permanent petrol smells. Revington TR information: Revington TR developed high pressure pump kit based on a Bosch pump and pressurised filter. Including an on/off tap connected between the petrol tank and the first feed hose.